Welcome to our Beautiful Maui Home. To see a VIRTUAL TOUR VIDEO of our home, click on the AMENITIES ICON above, scroll about 2/3 down the page on the left you will see the link. This home is our beautiful, charming, very spacious, 3-bedroom Polynesian Pole Home conveniently located above Wailea/Kihei, in the residential subdivision, Maui Meadows, with breathtaking views of the Pacific Ocean, the Wailea/Kihei coastline, the Maalaeaa Bay, West Maui Mountains, and the neighboring islands of Lanai, Molokai, Molokini and Kahoolawie. Our Hidden Hawaiian Gem property, is the perfect, self catering Maui vacation Home Away from Home, and away the crowds, which are found in hotels & condo's, but situated within two to three minutes of all amenities of South Maui, including all of the top beaches, shops, restaurants, and the stunning facilities of Wailea & Makena. Which include, world class golf at it's finest ! This spacious, modern 3 bedroom home is highlighted by its gorgeous open beam, full wood character, all naturally finished, open wood ceiling throughout, giant structural beams and poles, large, panoramic viewing windows, with sliding glass doors in all rooms, which open onto a very large wrap around, multi level patio/deck with casual seating, porch swing, sunbathing, barbacueing, and Jaccuzzi. The entire patio/deck has a very large roof overhang for afternoon shade, and over looks the Wailea/Kihei bay, creating a warm, welcoming, homely, atmosphere. Our home has recently undergone a complete remodel/modernization of the bedrooms, bathrooms, kitchen and outside deck, all have has been very tastefully decorated with Hawaiian island theme décor, very comfortable furniture, and various floral arrangements. The kitchen is built entirely of Maui Koa wood. The wood was harvested from Kaupo Ranch on Maui, and the cabinets and bar top, were hand crafted and custom made right here on Maui. You will only find this Maui Koa wood in our home and, one other home on Maui, no one else has it. The unique features of this Koa wood (compared with other Koa woods grown elsewhere) is it's combination of dark & blond streaks, giving it's, beautiful character only found in Maui Koa wood. The kitchen is FULLY appointed & equipped with everything you will need for cooking and entertaining during your vacation. The Kitchen is very spacious, and the facilities include side by side, full size, refrigerator and freezer with ice maker, a gorgeous Italian, 5 burner gas cooktop & gas oven, full size dishwasher, trash compactor and all pots, pans, dishes, and cutlery you will need. We have been told by guests our kitchen is well stocked compared with other places they have stayed, with everything a person needs for cooking and entertaining. We encourage our guests to let us know if there is something missing from the kitchen, they may need during their stay, this way we can equip our home to be as comfortable as possible while our guest's are "Home Away" from home. For formal dining, there is a huge Travertine stone Italian dining table with a very heavy/thick 4' x 8' sollid glass surface top which seats eight. Overlooking the kitchen, there is a Maui Koa wood bar top, which seats three. The living area is furnished with a, very comfortable, L shaped sectional sofa, and numerous other comfortable individual seats and a recliner electric massage chair. The main floor has polished, solid oak wood floors, while the bedrooms have plush white carpeting. There is a 54 inch flat screen TV with cable, DVD player, and wireless internet. The home has a washer and gas dryer. The three VERY comfy bedrooms are equipped with plush king size beds & bed linen, night stands, and mirrored closets. Each bedroom is kept cool with their own air-conditioning units and TV. We have had many guest's comment on how comfortable our beds are, and ask what brand, so they can buy one themselves. Our large master bedroom has a raised wooden platform for the Cal King bed, which adds its own unique character. The Master bathroom is appointed with beautiful neutral colored, Travertine Stone tile, with contrasting black & white stone marble counter tops. It has huge open shower, with a glass block window to let natural light in and, accommodates, two, "his & her's" shower heads. There and two wash sinks, a toilet, and European bidet. The bathroom also has a mirrored "one way" glass window, so you can see out, at the gorgeous view, while people on the patio/deck can't see in. The second bathroom is gorgeous too, it has very large single shower, a toilet, two sinks with a beautiful rose colored, stone marble countertop. Relax & enjoy sunset cocktails as the sun slowly makes it's way over the horizon of the Pacific Ocean, dine outside under the stars, over looking the Pacific Ocean & the night lights of Wailea, Kihei & Maalaea Bay, all on the very spacious, open wooden muliti level, patio/deck, equipped with Gas Tiki Torches, a 4 burner, propane BBQ with rotisserie, casual seating for 8, with fire pit, there is a casual dining table with seating for 6, all, perfect for entertaining or relaxing & soaking in the gorgeous view. We allow smoking on the property, but, NO SMOKING INDOORS....smoking is ONLY permitted outside. FYI ... This is not our only vacation rental home on Maui and we allow smoking on our other property too. In 4 years of renting vacation properties to, "outside only smokers" we have never had an issue, or complaint from a "non smoker" guest, about smoke residue inside our house's or on the furniture. We are non smokers ourselves, so we would be the first to spot any issue's with "smoke residue" ... If there ever were an issue, we would not allow smoking on our property. We can assure you; If you are a "non smoker" and would like to rent our property, you will have no issue with previous "smoking guest's"
This high quality, very well appointed home, is located in a very quiet neighborhood and is perfect for the vacationing family or couples that like to get a way from the crowds, have the ability to be able to provide their own dining, but also like to be close world class restaurant's, best beaches all the shops, golf & many more vacationing amenities the Island has to offer. The home is extremely spacious and is full of character and Hawaiian charm, all accompanied by the absolutely, stunning vista's of the Pacific Ocean and gorgeous, evening sunsets. It is truly a perfect "Home-Away-From-Home" location, for your Maui vacation :) The property is located 20 mins from the airport in the southern part of Kihei, in a quiet residential subdivision bordering Wailea and 2-3 minutes drive, (approx 3/4 mile) from the beautiful white sandy beach of Keawakapu, considered (by locals) one of Maui’s best & safest swimming beaches on Maui. From December thru April, you will be able to whale-watch from the beach and with binoculars (provided) from our patio, grocery stores & much more are a 3-5min drive from the house. The property is located 600ft above sea level, well above the tsunami zone - There are no midnight evacuations here due to tsunami flood warnings, as you would find at the lower elevations closer to sea level .. A tsunami warning may or may not occur during your stay on Maui, but if it does, they are not much fun if you get evacuated at midnight out of your hotel or condo because you are staying within the coastal tsunami zone ? The property gets a gentle trade wind breeze in the late morning/afternoon, unlike properties closer to the ocean, which catch the full brunt of the daily winds & can make the day, quite uncomfortable. The glass doors lead to the sun deck & Jacuzzi , with a spectacular view of the Pacific Ocean to greet you. The sun deck is surrounded by, Hawaiian gas Tiki Torches , has a beautiful round glass table, seats 6, porch swing, & barbecue. The unique benefits of this home abound you as you walk thru the front door, you are immediately greeted with the stunning panaramic view of the Pacific Ocean ahead, every room in this home has an ocean view, including the bathrooms. 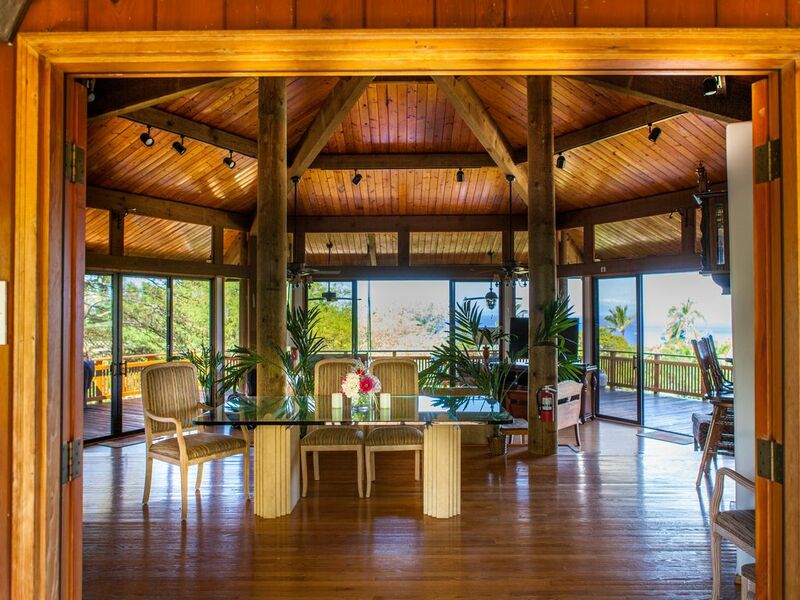 The entire home is constructed with a combination of naturally finished woods including, pine, douglas fir, spruce, oak and our favorite; The Maui Koa, which is only found in our home and one other on Maui. The bathrooms are beautifully appointed, with a combination of natural stones and marble. All bedrooms in the house have an ocean view and are appointed with very comfortable Cal King beds. The Master bedroom has its own bathroom, bedrooms 2&3 share their own bathroom. Our kitchen is built for Maui Koa wood and is very well appointed, it is suitable for any gourmet chef to use. A Kitchen this well appointed, is very rare to find in a vacation rental property. Our dining table seats 8 spaciously, but we have had 12 guests dine comfortable around it. Whether you prefer to sit & relax on the porch swing watching the sun slip away over the horizon of the Pacific Ocean, or like to be the gourmet cook in the kitchen, and watch the sun slip away over the horizon of the Pacific Ocean, this home is perfect for all tastes, and for the perfect for any Maui vacation. toilet, shower, bidet, Master Bath: Spacious Walk-In shower with 2 shower heads. Master Bath: Spacious Walk-In shower with 2 shower heads. Double sink counter, toilet, bidet, towels, hand towels wash cloths. We are 2-3 minutes drive from Wailea Town Center and the Shops of Wailea, which include designer shopping and world class restaurants. 3-4 minutes from the town of Kihei. All rooms on the property have a panoramic view of the Wailea/Kihei coastline, the Maalaleaa Bay, West Maui Mountains, and other Hawaiian Islands beyond. Along with the sunset over the Pacific Ocean. We are a 2-3 minutes drive from all of the South Maui beaches, including Keawekapu Beach, considered by many locals as the best and safest swimming beach in Maui. A/C units available in bedrooms only. Parking for 2 cars provided. L shaped Sectional Sofa and various chairs available. Seating for 6 people is available. Electric massage chair. Fully stocked: pots, pans, crock pot/slow cooker/ baking pans, BBQ items, plates, utensils, glasses, mugs, serving dishes, dish rags, kitchen towels, dishwashing liquid. Fully stocked: pots, pans, crock pot/slow cooker/ baking pans, rice cooker BBQ items, plates, utensils, glasses, mugs, serving dishes, dish rags, kitchen towels, dishwashing liquid. Dining table seats 8 people, place mats & full dining cutlery included. SMOKING IS ALLOWED 'OUTSIDE' ONLY PLEASE. Private hot tub on patio deck. This very spacious home has 3 large bedrooms, a huge living /dining room & kitchen combined. Every room in the house has a spectacular view of the Pacific Ocean & Island beyond. It is the perfect self catering get-a-way, for your perfect Maui vacation. The home is very well tastefully appointed, with a combination of Hawaiian & European furniture. The entire home has been recently remodeled thru out, including new furniture, appliances, bathroom fixtures & drapes. The kitchen is fully stocked with pots, pans, loads of knives, cutting boards, wok, rice cooker, slow cooker, over head microwave with outside extraction fan, just about everything you will ever need for cooking .. If there is something missing please let us know & we will get it ? The view and deck were spectacular! Stewart and Andrea were super friendly in person and also attentive over text. The house location is super convenient to beautiful Wailea beaches (10 min drive). The views from the house are beautiful, and the deck is great--we made s'mores at the fire pit and spent nights in the hot tub looking up at the stars. The pool they're finishing is also super beautiful! Worked great for our family and we'd definitely stay here again!! Beautiful home in the perfect location. Owners are great hosts! We have stayed in a lot of VRBO's and this one was by far one of our favorites. The quiet peaceful setting and beautiful views from every room are amazing. The home is very clean and comfortable with lots of room to relax. I highly recomend this home if you are coming to Maui! When considering a place to stay in such a gorgeous place like Maui, the outdoor spaces are something you need to consider because if you like being there, you won't have to pay to be somewhere else. The outdoor spaces were spectacular and where we spent most of our time. The sunset views were amazing. On our last night, the sunset was one I'll likely remember for the rest of my life. Many people on the island were talking about the sunset the next day. The indoor facilities were better than being at home. Watersport equipment was great - beach chairs, umbrellas, snorkel gear, and four boogie boards (though we still rented gear through Snorkel Bob's). If I can recommend one thing: don't book this, because I want it to be available whenever we go back! :D Stewart was very accommodating and kind to us. Total in our party was three children and four adults and we were comfortable the entire time. Once you have booked with us, we will email you links to all of the visitor attractions, Maui has to offer, where, at a click of a button you can view on line, and make bookings in advance of you arrival on Maui. With this visitor friendly tool, you can spend more time enjoying your vacation, while you are on Maui, instead of planning it while you are on Maui, and possibly missing out because a preferred activity has booked up during your stay ahead of time.